« Gimme a break…I hope it’s not a fracture! I just read Jason Robillard’s The Barefoot Running Book: a practical guide to the art and science of barefoot and minimalist running. Now that’s a mouthful, but it’s also a pretty good description of what’s inside. 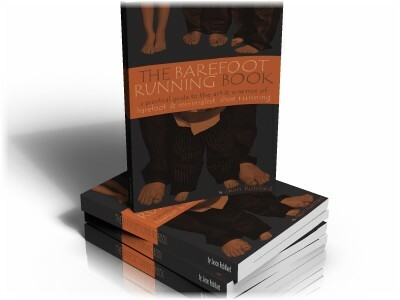 I would recommend the book to any beginning barefoot runner. The first thing that struck be about the guide is that it is a compact 60 pages, and that’s a good thing. The reality of our sport is that it’s pretty simple. There’s only so much one can say. At the same time, as one who is more or less, self-taught, I would have found Jason’s recipe very useful when I was starting on what he calls “the journey.” And, the book would have given me a heads up on most of the questions that occurred to me along the way. This kind of “coaching” is especially valuable as there just aren’t a lot of barefoot Yodas around. Jason’s philosophy is pretty well aligned with my own, characterized by the first of his principles: The no single right answer. By answer, he means, running style. There are different styles of barefoot running and if you “listen” to your feet, you’ll discover what works best for you. I agree. Oddly, he deviates from this view when it comes to cadence, and that is my only minor beef with his approach. Jason takes a pretty hard line on 180 strides per second being the minimum for barefoot. Personally, I’ve never cared to measured cadence (OK, it’s cause I can’t read a watch without my glasses) nor felt the need. I was running with the very experienced Barefoot Preston last weekend and bounced it off him; he was right with me on this. But you have to give Jason credit for noting that Turning Japanese by the Vapors beats it out at precisely the proper pace; that I can handle. A dedicated beginner could surf around the web and find much of what is contained in the guide. But it’s great to have it all in one place, consistent and well-organized. There’s less value for an experienced runner, but I like having the framework to help me teach others. This entry was posted on May 3, 2010 at 8:52 pm and is filed under Barefoot Running, Other Runners, Research. You can subscribe via RSS 2.0 feed to this post's comments. You can comment below, or link to this permanent URL from your own site. He’s a pretty interesting guy. Talks about himself as slow and a lazy runner and then goes on to describe his strategy for running ultramarathons.